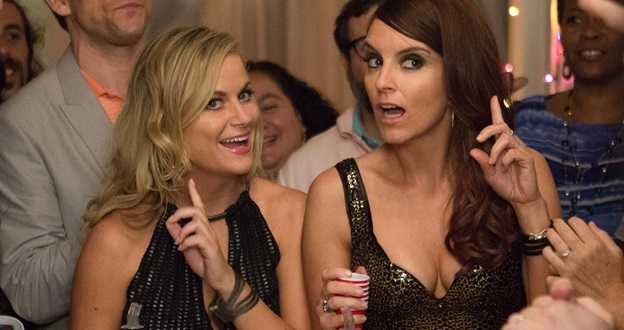 The movie genre of forty something women coming of age has hardly been touched in Hollywood. Wait… that’s because older women should have their lives figured out while living in their white-picket fenced homes along with their beautiful Christmas card worthy family. Therefore the movies that could fall into that category are almost absolute. 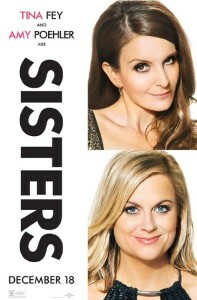 Sisters takes that notion and flips it on its’ head, giving viewers a funny, authentic and fresh look at women trying to find themselves while having a blast on top of it. The premise of the film is simple, sisters Maura (Amy Poehler) and Kate Ellis (Tina Fey); go back to their hometown of Florida when they learn that their parents Bucky (James Brolin) and Deana (Dianne Wiest) have sold their childhood home. They get upset that their parent’s never consulted them and must now go through their old rooms full of “priceless” 80’s items such as Care Bear pajamas, fuzzy slippers and pink dial-tone phone and boom box. Maura is the more responsible one of the two sisters and walks around with inspirational note cards as a way to lift herself up from her divorce. On the other hand Kate, an aesthetician and hairdresser, can barely hold down a job and her own college-aged daughter, Haley (Madison Davenport), can barely trust her to be a dependable mother. In their childhood rooms, they drink copious amounts of wine out of teacups (naturally) and in reading out loud their old diary entries realize that the they had the exact opposite experience in high school from each other. Maura worried way too much about other people, she was the girl who held people’s hair while they puked at parties, while Kate was the life of the party, the girl who once scaled her parents’ fireplace in a drunken night. In that moment, they realize what they have to do; they need to throw one last Ellis Island epic party at their home. Maura gathers up the nerve and invites over her cute neighbor James (Ike Barinholtz) and decides she will try to flirt with him and have a wild night for once. She also appoints Kate as the “party mom,” meaning she will have to make sure the house stays clean, no fires, no running through walls and will have to hold people’s hair while they puke, just like she did when they were teenagers. Poehler and Fey are our generations Laurel and Hardy, they work so funnily against each other, that having one without the other seems unfathomable. Their comedic timing is right on the mark and I found myself literally laughing out loud through many scenes from beginning to end. The jokes worked well, they weren’t too crude nor were they too safe, they were just right for this type of movie. Had it gone either way, it would have felt either awkward or boring. The cameos were excellent from Maya Rudolph, the high school mean girl to John Leguizamo, the ex-hot cool guy who now just hangs out by the liquor store and John Cena, the stone faced drug dealer. Bobby Moynihan stole many of the best scenes as the guy who tries really hard to be funny and liked but can’t seem to get it right. I can see him transitioning from Saturday Night Live to film sometime soon.